This morning, I awoke at 6am, walked Max, read the BBs for half an hour, ate breakfast (moving my laptop into the dining room and continuing to read everyone’s blogs), had a shower, got dressed, kissed Joel goodbye and left for the post office, full of anticipation. I had to find a parking space and then queue for 5 minutes getting more and more excited. Finally I got to the front of the queue and the clerk handed me my package – it was from Becky (I was starting to suspect this as everyone else got their packages!) I don’t know how I managed to get into the car and drive calmly to work with out ripping the package open straight away! Most people who read Becky’s blog will know that Becky’s finishing is superb – witness her recent scissor pockets and she is quite humble about it too. As soon as I got into the library I opened the package. What an amazing gift! 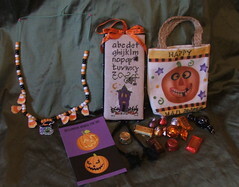 Becky sent me a doorknob hanger which is just gorgeous, an adorable necklace with stitched halloween pendants, a card and a treatbag full of yummy candy (most of which I cannot get in Western Australia – Becky how did you know!) Thank you Becky from the bottom of my heart – I am beside myself – a wonderful wonderful gift! Thank you! Here is a nice close up of the doorhanger Becky made for me. I am still over the moon with this gift – I just love it!